The Airbus Helicopters AS355 is a twin-engined light utility helicopter that can accommodate up to 7 passengers. Development of the Ecureuil started in the early 70s under the Aérospatiale banner with the single-engined AS 350. The first flight of an Aerospatiale AS-350 took place on 27 June 1994. A twin-engine version of the AS350, the AS355 Ecureuil 2 flew first on 28 September 1979. The Eucureuil 2 entered production as the AS355 E. Early 1982, the AS355 F with a higher max takeoff weight replaced the AS-355E in production. The AS355 F was followed by the AS355 F1 in January 1984 and AS355 F2 in December 1985. The AS355 N recieved the DCAG-F certification on 13 June 1989 and deliveries of this model started in 1992. The AS355 N is fitted with two Turbomeca Arrius 1A engines and a Full Authority Digital Engine Control (FADEC) system for better M.T.O.W and better single engine performance. The AS355 NP Ecureuil recieved the EASA certification on 15 February 2007. The AS355 NP Ecureuil 2 is fitted with two Turbomeca Arrius 1A1 turboshaft engines and a new AS350 B3-based main gearbox, increasing maximum take-off weight to 2,800 kg (6,173 lb). The AS355 Ecureuil 2 is marketed in North America as the 'TwinStar'. The ICAO Aircraft Type Designator with Wake Category used to classify aircraft types for the AS355 helicopters is AS55. The helicopter divisions of MBB from Germany and Aérospatiale from France merged in January 1992 to form the Eurocopter Group. 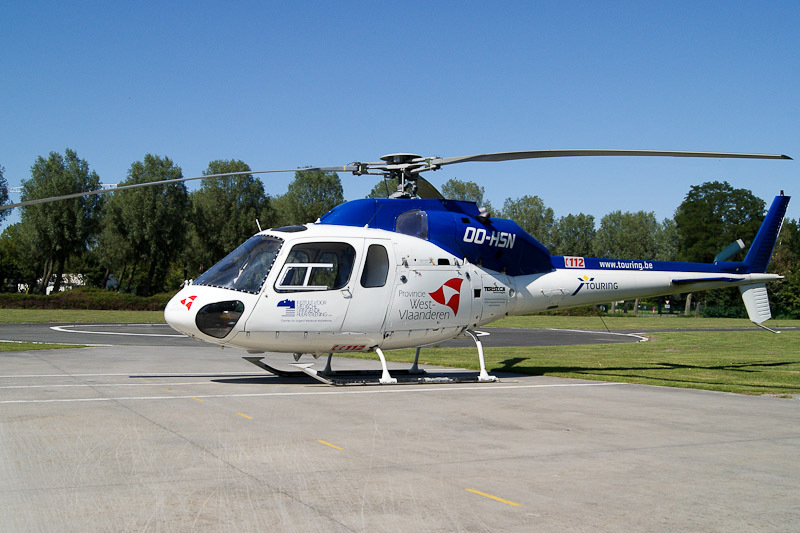 As a result of the merger between the Eurocopter parents Aérospatiale-Matra; DaimlerChrysler Aerospace (DASA) and Construcciones Aeronàuticas Sociedad Anonima (CASA) in July 2000, the Eurocopter group became a division of the new formed EADS (European Aeronautic Defence and Space company). Taking off into 2014, EADS was rebranded as "Airbus Group". Uniting all its activities under a single brand, its helicopter division Eurocopter was rebranded as Airbus Helicopters on 8 January 2014. On 30 January 1990, the 1989-built Aérospatiale AS355 F2 Ecureuil II c/n 5424 was registered JA9964 in Japan with Sony Trading. Registration JA9964 was cancelled on 4 October 1993, and on 30 September 1993, the helicopter was registered RP-C1688 in the Philippines with Gotesco Properties Inc. On 31 January 2005, the helicopter was registered G-CDFV in the UK with Lloyd Helicopters Europe Ltd. in London and on 13 July 2005, the helicopter arrived as RP-C1688 by road at Oxford-Kidlington. Lloyd Helicopters Europe re-registered the aircraft G-JEMH on 1 March 2006 and on 6 April 2006, the G-JEMH was registered with PJM Helicopters LLP c/o East Midlands Helicopters, Loughborough. On 8 April 2009, after the AS355 F2 was sold to Heli Service Belgium registration G-JEMH was cancelled and on 16 April the helicopter was registered OO-HSN in Belgium with Heli Service Belgium N.V, Halle. At their facilities maintenance was carried out by HSB and the OO-HSN was prepared for its service as medical helicopter. On 25 June, Heli Service Belgium AS355 F2 OO-HSN entered service as 'MUG-Helikopter West-Vlaanderen'. The MUG (Medical Emergency) helicopter is operated by the Instituut voor Medische Dringende Hulpverlening and is stationed at EBSJ Brugge / AZ Sint-Jan, the EMS-station next to AZ Sint-Jan in Bruges, Belgium.